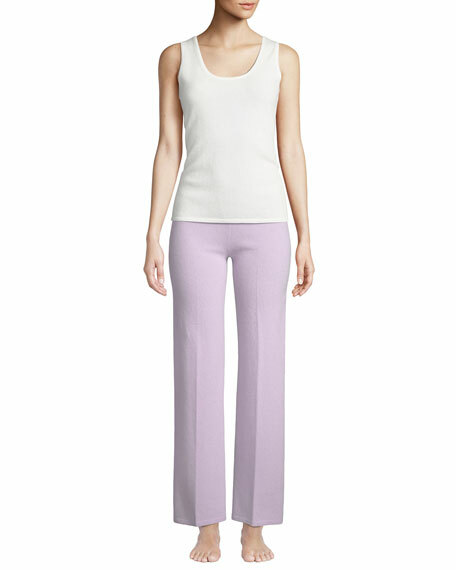 Lounge pants in solid knit. Approx. measurements: 32.5" inseam; 38" outseam. Escada Sport lounge pants with logo embroidered waistband. Mid rise; drawstring waistband. Back patch pocket. Straight fit through legs. Full length. Pull-on style. Cotton/Cashmere. Imported. Hanro "Balance" lounge pants in French terry cloth. Drawstring band sits high on waist. Straight, relaxed legs. Side seam pockets. Hanro "Balance" lounge pants in French terry cloth. Drawstring band sits high on waist. Straight, relaxed legs. Side seam pockets. Pull-on style Viscose/spandex. Made in Portugal. Model's measurements: Height 5'10"/177cm, bust 33"/84cm, waist 25.6"/65.2cm, hips 35.8"/91cm, dress size US 2-4/FR 34-36. Hanro lounge pants in stripe pattern. Elasticized, drawstring waistband. Side stitched pockets. Relaxed, straight legs. Pull-on style. Viscose. Made in Portugal. Model's measurements: Height 5'10"/177cm, bust 32"/81cm, waist 24.5"/62cm, hips 36"/91cm, dress size US 2/4.